This post is a topic of great interest to me. I’ve been doing extremely thorough brush research…everything from compiling side by side pics of comparable brushes, to excel tables, to hours of internet and in person research. We all know that brushes are extremely expensive and hard to come by. Moreover, finding a good brush is like finding the right bra. You can’t just pick up any brush and expect it to do the job. 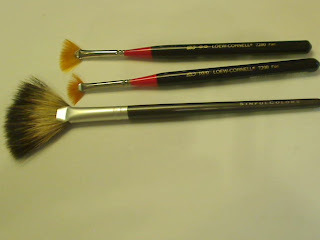 Different brushes have different purposes and varying levels of quality. There are many factors including but not limited to: price, length, shedding, bleeding, softness, denseness, what kind of bristles, cut of bristles, etc. Over the last few months my brush collection went from under 10 to over 50. Most of my research was found on google, beauty blogs, and specktra. I’ve found a lot of cheap alternatives to good brushes and I’m planning on checking some out in the near future. 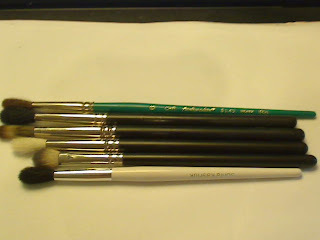 However at this time, I thought I’d show you my current collection of brushes. I organized them into category and I’ll provide a brief blurb about each of them. I forgot to take pics of my eyebrow brushes: I use a mini one from Sonia Kashuk that I love...only problem is that it's too short that it doesn't stick out of my brush belt and I lose track of it frequently. 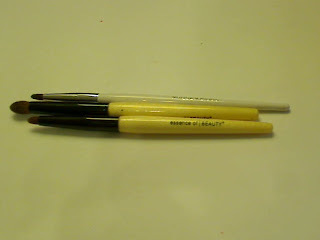 I also sometimes use the brush that comes with L'Oreal HIP cream liner to do my eyebrows. 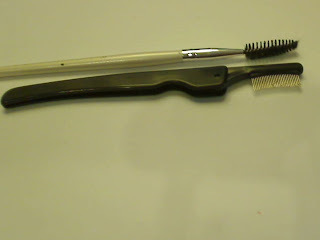 Lastly, I have an ecotools brush-the kind with an eyebrow brush on one side and the eyelash comb on the other. Pretty basic, you can find these anywhere. 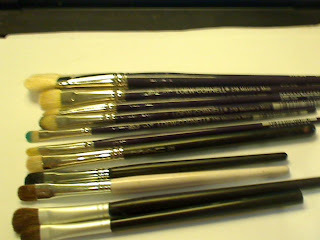 These are what I call my dense crease brushes. From top to bottom we have a sonia kashuk and the bottom two are from Essence of Beauty. The pointed, dense brush is good for blending in the crease. I actually don’t use these brushes too often except maybe the smaller ones to shadow the lower lashline. The larger crease brush is my fallback to when my MAC crease brushes are dirty. All these brushes were around $5. 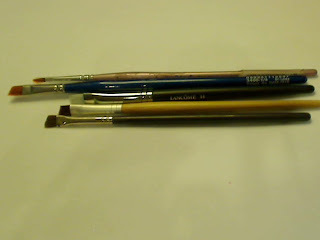 MAC 219 and Michael’s Loew Cornell paint brush. I loveeeee my 219. It’s perfect for creating an outer v shape, highlighting my tear duct, and providing color to my lower lashline. It’s one of my fav’s and it’s super soft. I’ve tried to find similar ones but haven’t found one as soft and dense. The Michael’s version works but it’s a little scratchy. I only use it once in a blue moon. MAC 227: another one of my fav’s! It has really compacted bristles that blend out any harsh line imaginable. I use it especially when I’m doing a bright eyeshadow look…I apply a highlight color and blend it into the crease color. I haven’t tried any dupes but I’ve seen some similar ones online from Posh Brushes and one from Coastal Scents that I’d like to try. Top brush is a spoolie brush from Sonia Kashuk. I often use this after I apply mascara to someone. When the mascara dries I’ll take this clean brush and brush out any clumps. The next brush is from bed bath and beyond…it has the metal teeth to separate lashes…I’ve only used this a few times when I’ve had major clumping issues. I probably wouldn’t use this on a client unless absolutely necessary because of the risk of getting too close to their eyes with the needle-like bristles. 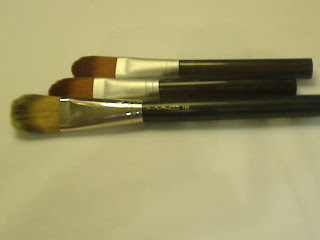 The top two are smudger brushes from essence of beauty. I think they came in a twin pack. They have rubber tips for blending out eyeliner and to achieve a smokey look. I honestly don’t really use these…I’m not a huge fan of the eraser like rubber tip. Most of the eyelining I’ve done is usually a distinct line…I’m going to try and branch out to do more smudged eyeliner looks and hopefully this will come in handy. 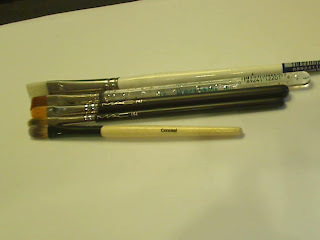 The bottom brush is a smudge brush from Lancome. Unlike the others, it has a small thin bristle head…I mainly use this for applying a thin layer of eyeshadow right onto the lower lashline—this works as an alternative of lining the waterline of sensitive eye clients. 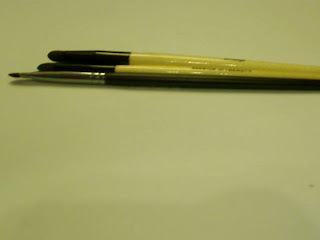 I like using brush #1 exclusively for liquid liner. I take my Revlon Colorstay, tap some into a palette and dip this thin brush into it when I’m trying to not double dip on clients. I don’t use the straight edge brush that much because it’s not usually my preference. I do however use it to sometimes smooth out a line I made with pencil eyeliner. My fav for gel liners is the MAC 266. It creates a perfect winged eyeline. The ecotools and Michael’s brush are just a little too thick. Sometimes I'll use them instead to fill in eyebrows. I haven’t found a similar brush yet that is as thin as the 266. I don’t use the Michael’s brush because it’s too soft to really do any kind of blending. I use the 224 on clients who have larger eyes…usually to put a light color on their crease or on the browbone. It also works with really dark pigments so that the color doesn’t go on too intensely to one particular area. The MAC 223 came out with the Raquel Welch Icon collection. I use it mainly as a crease blender but I like the MAC 222 better. The 222 fits more into my small eyeshape and the bristles are a little bit shorter so that I have more control of the brush. The MAC 217 is my all time fav for smoking out the outer V/outer crease. I use it nearly everyday. I bought the Sonia Kashuk as a backup to the 224. So far so good…I actually use it to apply cream concealer because it buffs it into the skin like a dream! Some people love these angled brushes but I use them occasionally. The top is a lancome brush and the bottom is the MAC 275. Sometimes I’ll use it to blend the crease into the outer V. I’ve found that I’ll use them more so to contour and blend the nose area. This is pretty much the most standard eyeshadow brush shape around. 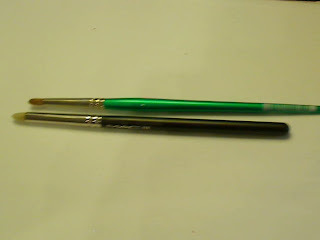 I always use these brushes when I’m applying color initially to my lid. The dense shape is perfect for packing on color as well as for blending one color into another. As you can see…I have several because I use so many different colors. 3) Two Medium Loew Cornell Maxine Mop shape brush: a great alternative to the MAC 239…I even like them a little better than the MAC brush. They’re cheaper and work just as well! 4) Two Small Loew Cornell Maxine Mop shape brush: I love these tiny brushes to do rainbow eyes or to apply color to the lower lash line. These tiny brushes really come in handy for blending tight areas. 8) Two random brushes: these are throwbacks from back in the day when I didn’t understand anything about brushes…probably from target…they do the job but they’re a little flimsy. Top two are from Michaels. They are perfect for combing out mascara clumps. I also really like them to apply mascara or fluidline to client’s eyelashes. Sometimes it’s hard to get at the base of lashes when you apply mascara on others. This is a popular trick used on many MUA’s-load the fan with fluidline and paint it right on any parts that you missed with the mascara wand. 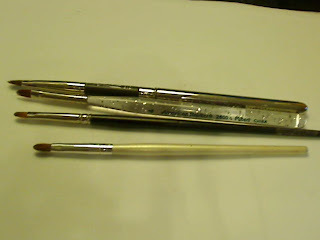 The bottom brush is a typical fan brush used for brushing off fallout. It works really well for brushing off extra product off your face charts without smearing the pages. I don’t remember where this brush is from. These brushes all work equally well in my opinion. I’ll interchange them all for using concealer, MAC paints, paint pots, etc. Remember-synthetic bristles work best with cream based products. I don’t use the MAC one that often because I don’t like how it has the detachable part. You can pretty much find affordable lip brushes anywhere in my opinion. These are awesome for applying liquid foundation to create an airbrushed look. Conversely, it can be used to apply powder products such as high pigmented blushes sparingly. On top is my MAC 187…I use this all the time with my mineralized satinfinish foundation. The one below-I can’t remember where it’s from…but I got it online from one of the MMU companies. I’ve found that this one is better for applying powder products since the bristles aren’t as dense as the MAC ones. There are a lot of similar ones out in the market but you have to test them for density and how well the bristles blend into each other. Top two are from Studio Tools from Target, under $5 each. I like using these for applying primer and moisturizer to clients. The MAC foundation brush is better to me for applying cream and liquid foundation because the bristles are a bit more dense and can really push product into the face. It is also larger which cuts down application time. Top two are from MAC…I use them for setting makeup with various powders such as my translucent setting powder on MSF natural. I like how they’re soft and fluffy so they apply a light layer of makeup. The bottom came with my Bare Essentials MMU kit. It’s not my fav…a little too short and scratchy. Washing and conditioning it has helped a little but I pretty much only use it if everything else is dirty. 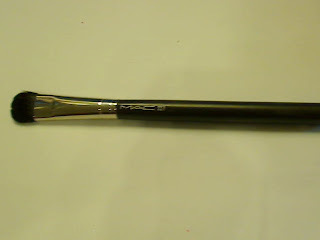 1) MAC contour brush: this is the ONLY brush I use to contour cheeksbones, jawline, etc. I use it with my sculpt and shape duo nearly everyday. 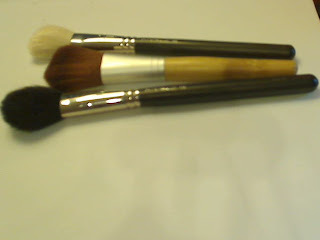 I think Posh Brushes has a good dupe that I’m eager to try. 2) Eco Tools blush brush: this brush is super soft but I noticed it’s better for applying a really light layer of blush or bronzer as opposed to concentrating it at the cheeks. It’s most likely due to the larger shape of the dome as well as the synthetic bristles. 3) MAC blush brush: I love this brush…it’s the perfect size to fit the apples of the cheeks…this is my main blush brush I use. 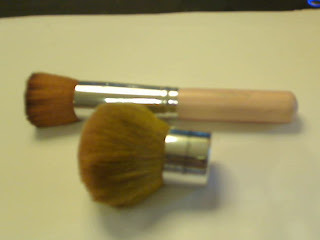 Top is my pink coastal scents buffer brush. I heard various reviews about this brush, but I love it! It’s super soft. I’m definitely going to order a back up for use on my clients. Its dense flat top has saved me several times when blush has gone on too vibrant. This brush softens and tones overdone blush or bronzer immediately. I think it’s great for MMU as well. Sometimes when I don’t feel like wearing foundation I’ll just buff in my MSF natural with this brush and it goes on super smooth. The only con is that I noticed a few bristles poking out from the rest but I trimmed them with scissors and haven't run into that problem again. 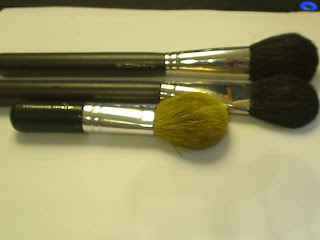 The other brush is a bare essentials Kabuki. I used to use this back when I was first learning to contour and I would need to buff out my mistakes. 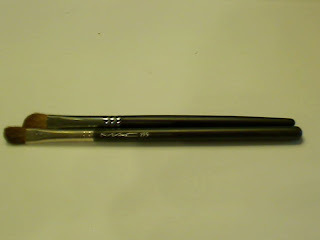 Now that I have the coastal scents brush I don’t use this one anymore. 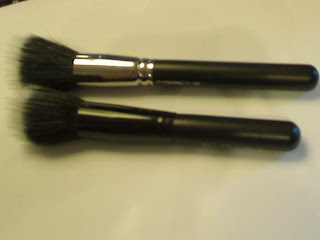 Like the other BE brush, the bristles are scratchy and aren't compact enough to do any serious buffing. I could do without this one. Stay tuned for my next Michael's brush haul entry. I got some good deals! If you have any questions, just let me know! Omg that's a lot of brushes! I love seeing what brushes other makeup addicts are using. I have a variety myself, but the MAC ones hold my heart dearly. What brushes are your must haves? ok your brush collection is really nice! i kinda only have 1-2 for each type of brush but i need more!! So many brushes! I don't even know where to start looking, haha. Thanks for the reviews. :) I definitely need to pick me up a 227! Im so jealous of your makeup brush collection heheh, this is a great review and very informative, i just learn the use of the fan brush lol, thanks for sharing :D.
wow! that's A LOT of brushes..!! great post! i'm still actively adding on to my brush collection, so this helps a lot. thanks! aaaaww that is GREAT!!! I love reading about brushes!!! And thanks for the wonderful comparison :) Love it! you should try the ulta highlighting brush. its like a dupe of the stippling brush from mac. i think the bigger one. i've been using it for a while and its great ! no shedding and i use it everyday. plus its only like 20 bucks. New Makeup By RenRen Ad!